Cat at Heart by Tanya: Trending: Mad About Denim. Denim. It is the universal fabric that can be spotted in every single person's outfits. It wasn't up until Nylon's August "the denim issue" when I recognised my appreciation for the fabric. PLEASE NOTE: I am aware that my issue of Nylon is 2 months late but in Australia, it takes longer for international magazines to arrive and I thought denim is suitable for all seasons so I thought I would blog about it anyway. #sorryimnotsorry (lol). I have been collecting Nylon magazines since '09 so i've come across a number of denim issues. The magazine and my feelings towards denim are mutual and their choice of honouring it once every year is just unbelievable. 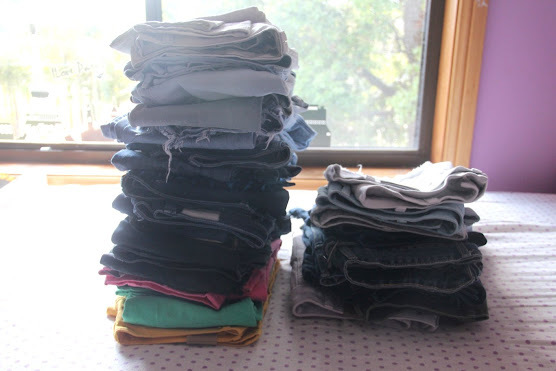 As you can see, I have accumulated a few pairs of jeans and shorts over the last few years. To some, I have a lot of pairs while to others, I have only a few but I am happy with what I have. Brands include Insight, Lee, Ksubi, Dotti, etc. Personally, my favourite brand of jeans is Ksubi but I feel like it depends on an individual's body type and preference of style. I wear jeans throughout most of my Autumn/Winter and shorts in Spring/Summer so denim is definitely a necessity in my wardrobe. A simple pair of blue jeans that fit like perfectly could be all you need for bottoms as a lot of things can go with denim. I am still in the search of the perfect pair of jeans but I am hopeful that I would come across a pair which I can blog my excitement about! In the meantime, I am happy with the pairs I have in the array of colours, styles, textures and patterns. Art Disco Hound of Love (Pug) Denim Jacket (buy here) Denim jackets are must have staples for everyone's closet and this one is definitely a most wanted. The distressed, oversized jacket is imprinted with eco-friendly patches of pugs, yin yangs and old school tattoo style quotes and can edge up any outfit. Topshop Moto Dip Dye Denim Dungarees (buy here) I personally recognise "dungarees" as overalls and I have always had a pair in my wardrobe whether I was 5, 10 or 15. These fit in perfectly with the ombre, gradient dip dye trend and would be worn perfectly with a cute blouse in the blazing hot summer. Romwe Leather Sleeve Blue Denim Coat (buy here) Khaki and denim jackets with leather sleeves seem to be the latest hurrah in the fashion world and this one is rockin'. Its asymmetrical shape on distressed midtone blue denim is ornamented with two zip pockets and a fake flap. Evil Twin Chaos and Order Bustier (buy here via General Pants) Being from a Chinese background, I have been raised to understand the importance of Yin and Yang so this bustier's pattern is eye-catching and another must have for me. It is made from a softer, thinner black denim that would be perfect for festivals! Jeffrey Campbell Tardy Stud in Blue Denim (buy here via Solestruck) Studs. Jeffrey Campbell. Denim. There possibly couldn't be a more edgy combination and it looks super comfortable to walk in because of its platform. Sally Hansen Salon Effects Real Nail Polish Strips in Skinny Jeans (available at local pharmacies/drugstores) I have been a fan of these nail polish strips as soon as I heard about them on Youtube and with the wide range of patterns on offer, this denim pattern is one to try. It looks realistic, easy to apply and is quite long lasting. J Brand Denim Flocked Low-rise Skinny Jeans (buy here via Net-A-Porter) Working perfectly with the Baroque trend, this pair of grey denim jeans is subtle yet noticeably different. The intricate detailing would be suitable for casual wear with just a simple top and flats or can be dressed up for a nights out. Ksubi Albuquerque Cut Offs in Crowded House (buy here) The name "Crowded House" is suitable for this pair of shorts because of the loud, leopard print-like "black flock embroidery". The distressed cut off, exposed pockets and leopard print screams Summer! Summer! SUMMER! Stussy Denim Wash Beachpack in Light Blue (buy here via General Pants) Summer = Beach. And when you head to the beach, the perfect bag is a must. This unisex bag is not only good for the beach but can also be used for school or any other occasion. 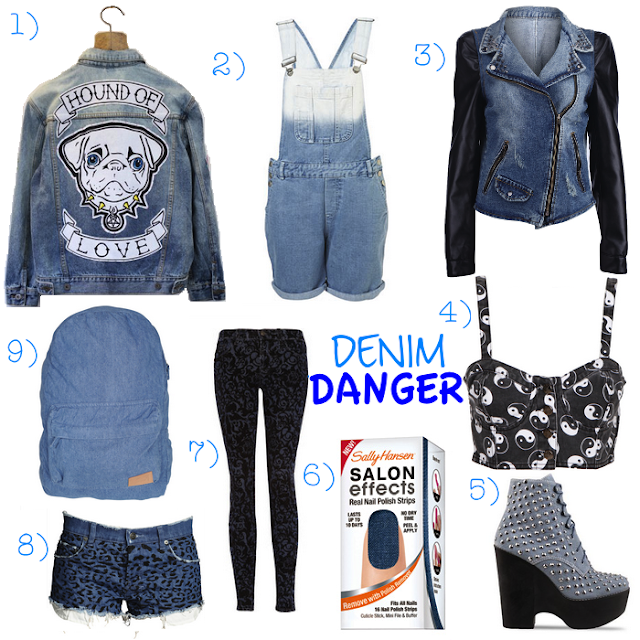 Being denim allows it to match a lot of outfits without clashing. you're right though, denim is so interchangeable.. you can wear it at any time of the year! and it's so versatile! looks great with everything! maaan I love the jacket!